Merelani Tanzanite mining area is the worlds single source of tanzanite, and is situated in the Simanjiro district of Tanzania, 70 km southeast of Arusha and 16 km south of Kilimanjaro International Airport. The mining area is tiny, only 2 km by 4 km, and is divided into four blocks ( named A through to D). Tanzanite was formed over 585 Million years ago, created by massive tectonic plate activity and intense heat in the area that would later become Mount Kilimanjaro. Tanzanite deposits are located within a relatively complex geological environment and is found in “sausage shaped” boudin structures, typically located in the hinges of isoclinal folds (folds dipping in the same direction). Mining of tanzanite is generally still largely carried out by individuals using artisanal methods, with operations at TanzaniteOne’s Block C having the benefit of the only state-of-the-art facility in the mining district. Tanzanite is mined underground in tunnels, via production drives that extend from decline shafts, running on the dip of the ore body. At TanzaniteOne, current shaft depths reach 800 meters, and geological testing in 2013 indicated that the layers of tanzanite exist down to 2,000 meters, which gives the mine a 30-year lifespan at the current mining rates. However, as deeper depths are reached , extraction becomes increasingly difficult , so mining may finish earlier. The smaller mines in the other tanzanite lease blocks ( B & D ) are currently mined using mostly simple methods and basic air supply systems, and do not have the ability to dig any further without significant investment and the purchase of mechanized mining equipment – thus their ability to dig much deeper is also restricted. No data for the amount of tanzanite left in the several hundred small mine sites situated in D & B block sites exists. That Tanzanite One has now reached a depth of at least 800 meters is an astonishing achievement. To put that into perspective, that's around three times the height of the Eiffel tower, and the same depth as the height of the tallest building on earth the 829.8 m (2,722 ft) tall Burj Khalifa in Dubai. Soon after the discovery of tanzanite in 1967, word got around about the exquisite new gemstone, and prospectors and tribesmen began to lay claim to the mining areas. 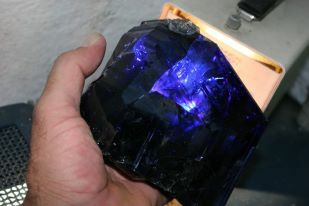 Between 1967 and 1972, an estimated two million carats of gem-quality tanzanite was produced from open-cast mining operations on what is now Block C.
In 1971, the tanzanite mines were nationalized and mining was taken over by the State Mining Corporation, STAMICO. STAMICO's production records during the first five years indicate a decrease in grades, mainly attributed to haphazard mining and theft. In 1978, Tanzanian Gemstone Industries, a state organization established by STAMICO, published a report that recommended full-scale mining of gemstones as viable. However, no meaningful action was taken. Production decreased during the next ten years, while informal, artisanal mining became widespread. By 1989, an estimated 30,000 artisanal miners were working in the area. In 1990, the Tanzanian government curbed artisanal mining and demarcated the area into Blocks A, B, C, and D. Block A was awarded to Kilimanjaro Mines Limited, Blocks B and D to small-scale miners, and Block C to Graphtan Limited, a graphite mining company. Graphtan ceased mining activities in 1996, and the mining license for Block C was acquired by AFGEM (African Gem Resources Limited). In 2000, AFGEM carried out a feasibility study for commercial mining of tanzanite, and mine development commenced in 2001. In 2004, the TanzaniteOne Group acquired AFGEM’s tanzanite business and assets. In 2012 TanzaniteOne was restructured and became a wholly owned subsidiary of Richland Rescources Ltd. 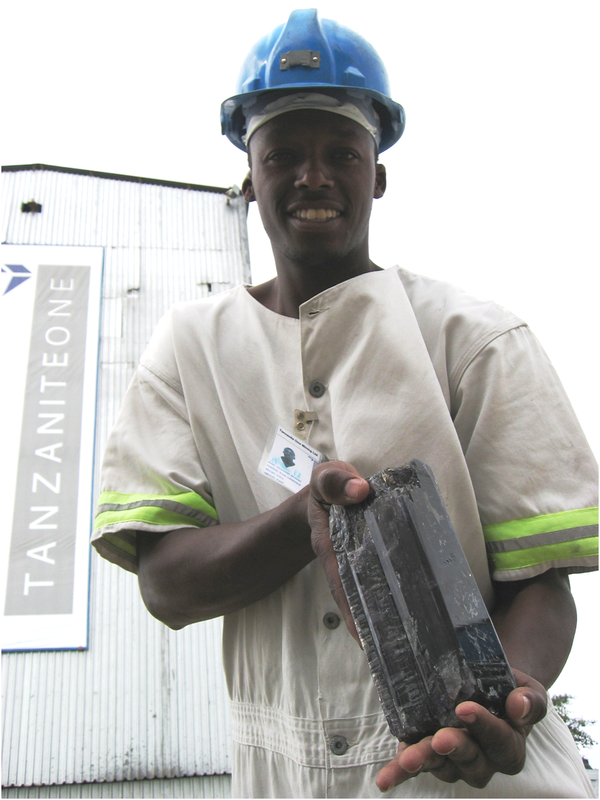 In December 2013, Richland Resources and Tanzanian government through State Mining Corporation (STAMICO) signed a 10-years joint venture (JV) agreement over TanzaniteOne , in order to comply with a provision of new Mining Act of 2010, which required 50% local Tanzanian ownership of local mines.